John Patterson is a long-time senior investment banking executive with extensive experience in raising capital for, and providing advisory services to, companies of all sizes across the subsectors of healthcare services, including health care related IT. Over the course of his 25+ year investment banking career, he has completed well over 100 transactions representing more than $10 billion in total value. Many of the transactions he has worked on involved publicly-traded companies. In addition to his corporate clients, John has extensive relationships within the private equity community, including with many of those most active in the middle market healthcare services industry. 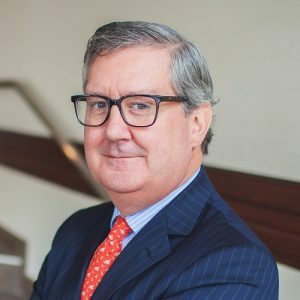 John has served as a Managing Director in the health care groups at a number of leading Wall Street investment banking firms, including Donaldson, Lufkin & Jenrette Securities Corporation, Deutsche Bank Securities and RBC Capital Markets, among others. John also has significant operating experience as a senior management team member and board director for a technology startup in the digital media space and as a founder of a dental practice management company focused on pediatric oral health, which is backed by a Detroit-based private equity firm. Currently, he serves on the board of directors for a behavioral health company addressing the growing need for substance abuse treatment options in the U.S.
John has a BA in Economics from Bucknell University and a MBA in Finance from The Wharton School, University of Pennsylvania. He is registered with FINRA as a General Securities Principal and has Series 7, 24, 63 and 79 licenses.